When you stay at Perissa Mar in Santorini, you'll be near the beach, a 1-minute drive from Perissa Beach and 7 minutes from Perivolos Beach. 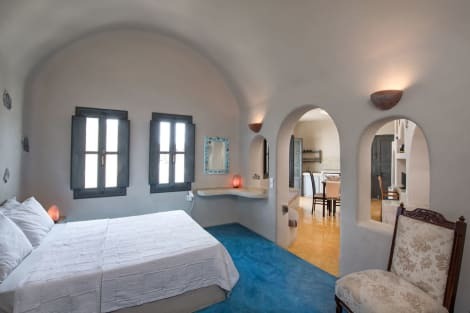 This guesthouse is 5.4 mi (8.7 km) from Santorini Caldera and 6.7 mi (10.8 km) from Athinios Port. Enjoy recreation amenities such as an outdoor pool or take in the view from a terrace. This apartment also features complimentary wireless Internet access and a vending machine. This family run apartment complex is located within walking distance from the centre of Perissa and is at less than 150 metres from the closest sandy beach. Guests will find a variety of restaurants and local taverns suitable for all tastes. Santorini Airport is about 15 km from the hotel. Make yourself at home in one of the 13 air-conditioned rooms featuring refrigerators. Your memory foam bed comes with Egyptian cotton sheets. Rooms have private balconies. Complimentary wireless Internet access is available to keep you connected. Private bathrooms with showers feature complimentary toiletries and hair dryers. Grab a bite from the snack bar/deli, or stay in and take advantage of the hotel's room service (during limited hours). Wrap up your day with a drink at the poolside bar. Continental breakfasts are available daily from 8:30 AM to 10 AM for a fee. Make yourself at home in one of the 28 air-conditioned rooms featuring refrigerators. Complimentary wireless Internet access keeps you connected, and satellite programming is available for your entertainment. Bathrooms have showers and hair dryers. Conveniences include safes, as well as phones with free local calls. 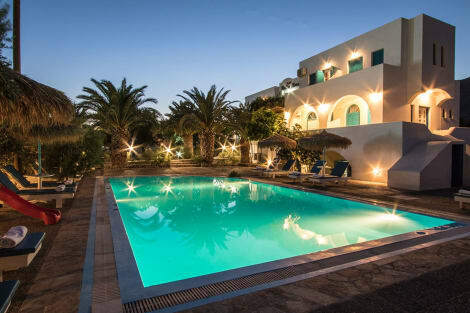 Located at Perissa, one of the most cosmopolitan villages of Santorini, Petra Nera is just 400 m away from the beach of Perissa.Hotel Petra Nera offers comfortable accommodation with private bathrooms and private balconies. All the rooms are equipped with Air Condition, fridge, TV. In the hotel you will also find a comfortable breakfast room, a swimming pool and parking space. Take advantage of recreation opportunities such as a seasonal outdoor pool or take in the view from a terrace and a garden. Additional features at this hotel include wireless Internet access (surcharge) and a television in a common area. When you stay at Veggera Hotel in Santorini, you'll be by the sea, a 1-minute drive from Perissa Beach and 7 minutes from Perivolos Beach. This 4-star hotel is 5.4 mi (8.7 km) from Santorini Caldera and 6.7 mi (10.8 km) from Athinios Port. The lobby is small to medium in size. lastminute.com has a fantastic range of hotels in Perissa, with everything from cheap hotels to luxurious five star accommodation available. We like to live up to our last minute name so remember you can book any one of our excellent Perissa hotels up until midnight and stay the same night.